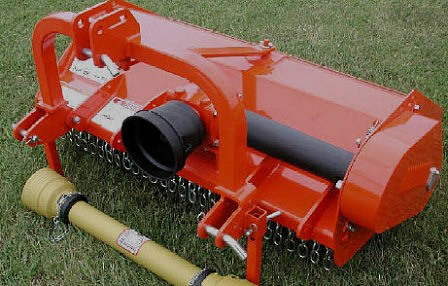 Model SLE rear ( offset adjustable) three point Flail Mowers are offered in 48" - 75" and for tractors with 20 to 45 hp. They have the dependable performance you need to stay on the job backed by 40 years of experience into manufacturing these machines. These flails have a powder coat paint finish to help insure a long attractive life. They come standard with a Series 5 Eurocardan drive line, double parking stand and Cat 1 Quick Hitch compatibility. It offers the No Tool Blade Change along with a adjustable working height roller. They are perfect for nurseries, property owners with pastures, golf courses & municipalities. TE Offset, heavy duty, three point Flail Mowers are made in Italy by the historic - world famous quality leader: the Sicma Corporation. 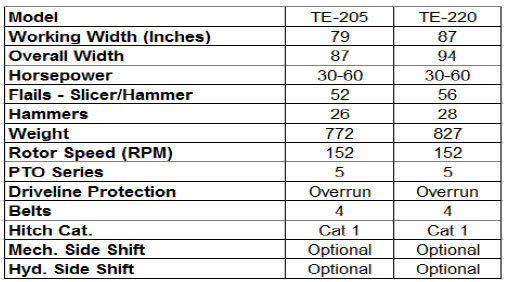 TEs offer you two working widths of 79 and 87 inches. These machines are perfect for heavy duty tasks and tractors from 30 - 75 hp. Clean trouble free cutting and shredding are yours.